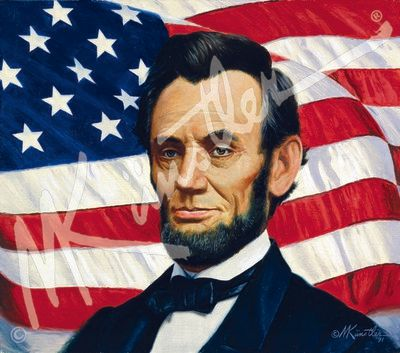 Mort Kunstler Hand Signed and Numbered Limited Edition Giclee Canvas:"Abraham Lincoln"
Size: 21" x 24" and 27" x 31"
About the Art: He looked and talked like his country: raw, rugged, and earnest. His concern for humanity, his never-failing belief in the people, made Abraham Lincoln among the most American of Americans. At the same time, he evolved into an astute political leader with the deft touch to mold and direct the nation through a horrible war. Abraham Lincoln was elected the sixteenth president of the United States in 1860. He would serve two terms, during which he fought to preserve the country's union, authored the Emancipation Proclamation to end slavery, and planned for reconstruction and healing after the Civil War. ...With malice toward none, with charity for all, with firmness in the right as God gives us to see the right, let us strive on to finish the work we are in, to bind up the nation's wounds, to care for him who shall have borne the battle and for his widow and his orphan, to do all which may achieve and cherish a just and lasting peace among ourselves and with all nations.